I have really enjoyed the Matchmaker series that this book is a part of. Each book is so different - set in different time periods, different locations, and written by different authors. The unifying piece is Miss Pearl - the Matchmaker. While Pearl's influence on each relationship is different, her character doesn't change with each author's interpretation. And she's a character I have grown to love. 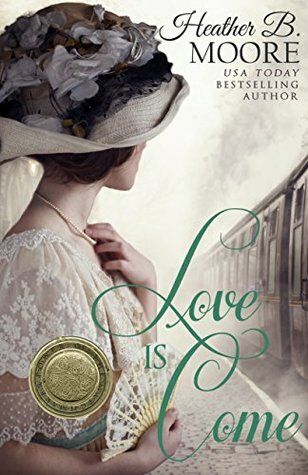 Love is Come tells the story of Nelle, a young New York socialite in the early 1900s. She's coming up to her 21st birthday, her best friend Dottie is practically engaged, and her parents are hopeful that Nelle will find a young man and marry soon as well. But, tragedy strikes and Nelle's world turns upside down with her parents' sudden deaths. She leaves to go stay with her Aunt Corrine and cousin Alice out in the country until her birthday when her trust will be turned over to her. On her first full day in the country, Nelle sets off to walk into town. Along the way she encounters Matthew who is Alice's beau. Being a gentleman, he accompanies Nelle into town but then the two go their separate ways. This is when Alice meets Pearl and a bit of hope begins to break the clouds of melancholy that surround Nelle as she tries to put Pearl's advice into practice. This story really pulled at my heartstrings. Nelle has a string of trials that weigh her down, yet she makes a valiant effort to still be a light to those around her. While her journey is difficult I think it makes it even more beautiful when at last love is come.